killed with a single cut to the throat in a halal abattoir. About two thirds of halal meat in the UK is currently imported. Farmers also hope to gain a share of the global halal market which is worth an estimated £75bn. Midlands Minority Ethnic Business Forum. The animals were slaughtered in a halal abattoir and then distributed to poor people in Bosnia. Today science and environment correspondent David Gregory said. Farmers signed up to it cannot use pig manure, GM feeds or alcohol-based cleaners. 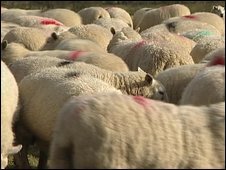 The NFU said it had been concerned about the welfare of animals but was reassured they would be stunned first. A machine is used to monitor the animal to make sure it is unconscious but not dead when its throat is cut. There are about two million Muslims in the UK but an estimated six million consumers of halal meat nationwide. country while making up just 3% of the population. the new markets now being opened up as a result of the Qurbani project.